Life in First Grade: Teachers hear all..or they can with this! HUGE GIVEAWAY! Teachers hear all..or they can with this! HUGE GIVEAWAY! It's seriously the neatest thing, y'all. You simply place it wherever you want to recorder and hit the red button. That's it! It records what the kids are saying so you can hear for yourself. To hear what was recorded, just plug it into your computer and click on the file. It has five speakers, so it really picks up the kids voices and allows you to hear exactly what is recorded. And the best part? NO BATTERIES. That's a huge plus in my book. The kids would come to this area and sit with each other and discuss the decodable reader that we had just read. Each time we learned a new comprehension skill like character, main idea, setting, etc. they would have to discuss that skill. 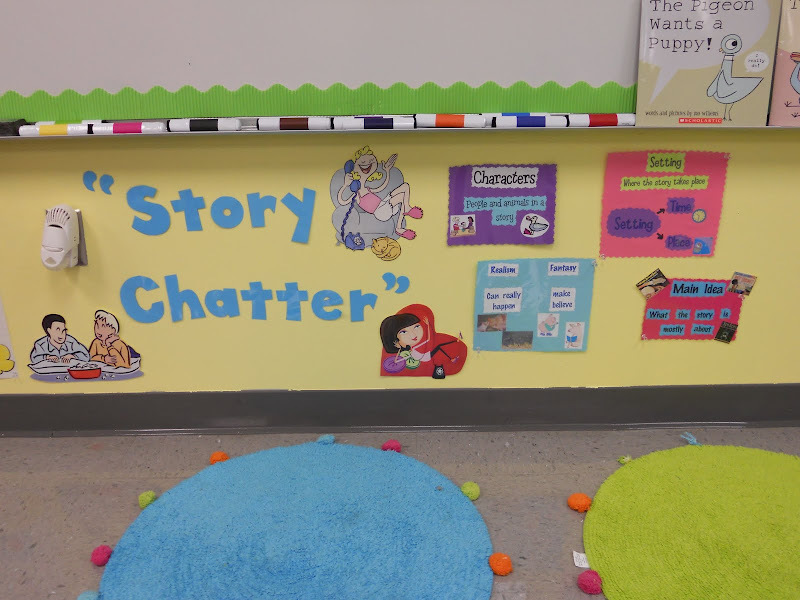 This center was close to my small group area, so I thought it would be easy to keep them on track and make sure they were talking about the book. 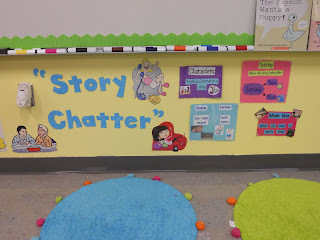 But usually when the time came for the group to go to story chatter, I had to answer questions from the other groups or check awaiting center work. I never had time to truly listen to what they were saying. So I did away with the center the next year. How perfect will the HearALL recorder work here??? I can't wait to bring back Story Chatter and use the HearALL recorder at it! I also have been reading Debbie Miller's Reading With Meaning and I love how she takes all the students' responses to certain questions and creates charts with them. This recorder would certainly come in handy to make sure all the responses were recorded accurately. You could even upload the recordings to your class website, blog, or wiki for parents to hear! This is just so much you can do with this neat little product! Now here's the best part! 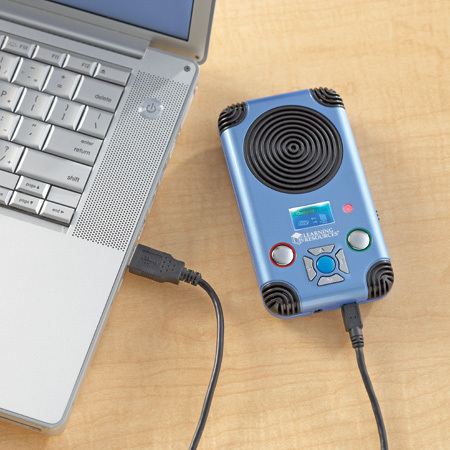 Learning Resources is giving away one HearALL Assessment Recorder! *Follow Life In First Grade and share how you would use the HearALL recorder in your classroom. Just comment below and leave email! I would love to use this in centers in my classroom! I would use this to monitor the fluency of my students! I would SOOOO use this to control my little ones from talking when they should be working :o) hee! hee!! I bet it would only take once for me to play it back to "prove" some little ones were chatting during work time! But, it would be fun for students to read or say a poem and playback. They would love to hear themselves! I would love to use this for assesment purposes- i can never keep up with my kiddos and this would be a great way to listen in carefully! I would use this during Daily 5 in the REad to Someone area. I'm not even sure I would tell students at first, so I could see if they were truly on task! What an awesome tool! There are numerous ways to use this in the classroom. The students could read to it and then listen to it. It could be an extra set of ears to ensure the integrity of center activities, and so on! I added this to my blog - please, please, please don't judge my blog. I just started one and I am very green at it! My blog address is http://hopscotch.edublogs.org/. I would use it to check students' reading fluency! That looks awesome! I would use it during literature circles! It's fun to hear their chatter! I would use this to help students improve fluency! I would use it to assess student fluency. I think it would be great to use this for fluency, especially for a student to lhear him or herself read. What a useful tool especially in workstations and daily 5. I would use this tool for both of those times throughout the day!! fingers crossed!!! I cannot tell you how many times I've tried winning this!!!! I would use it during Daily 5 for word work, listen to read, read to self...the whole lot! I would definitely use this for assessments and to monitor fluency of my students! I would love to win this for my classroom. I currently do a complicated process to make CDs of my kids reading and send them home with books~this would make it so much easier! Thanks for this opportunity. I would use it to record the students during centers. I have been wanting this product for a while! I would love to use this with centers! I have been eyeing this on Learning resources website. I would use it for work work, listen to reading, fluency practice, story telling, and on and on. I think it would be helpful anywhere in the classroom! I would use this for fluency checks. I have a few ideas for center time and fluency. I think the kids would really be able to identify what we need to work on if they could hear themselves. I'd also love to use this during parent-teacher conferences. This would be a great tool to use during a variety of situations throughout our day. I would love to use it to record students while they read to send to parents so they can hear them read at school. The Hearall would be great to listen in at workstations to see if children are on task like you mentioned. I also think it would be great to record children and play back so that they can assess their own reading for building fluency. I think I could also use it for kids who are practicing a reader's theatre for presentation. Good readings could be saved for a portfolio or used in our listening center. I would use it for student fluency. This would be awesome! I would use it for assessment and to help build fluency. I would use the HearALL for reading centers and fluency practice. I'd love to use it for parent teacher conferences too, just to give parents a better idea as to what they can work on at home. I would use hearAll for fluency practice with my first graders! I would love to use this in my fluency station. It's on the other side of the room and I would love to better monitor that station. As a pre-k teacher I"m too busy teaching to document all that I am teaching but I must assess my students progress for their report cards. I could record out small group and go back and assess. Also I tell stories each day and could record them for my listening center. I like my listening center to only have an auditory story then my students must listen carefully! Please consider me for this give away. I have been looking for something I can use to record stories for the kids to listen to. i think this would be perfect! I would use this recorder to listen to small groups and for fluency practice. I would use this for students to listen to themselves read to work on fluency. Very cool item! I would use it for helping students practice fluency, and for listening in to groups during problem solving. This recorder would be fabulous for fluency and and I am following you! Julie Gornall jg290@bellsouth.net Thank you so much for making this giveaway happen! I just found your blog!! You have soooo many cute ideas! How have I not found you before?? Anyway...I would definitely use this little baby for fluency practice! 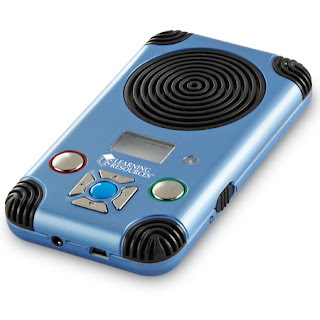 I would use this recorder with my special education students to increase their reading fluency! Create a French Fry Notebook!